Several members of the Positive Discipline Social Network have been having fun with the Positive Discipline Tool Cards. When they share their great examples, I ask for their permission to share with others. Following you will find some helpful and encouraging examples from Katie Clark. The following question from Tamee on the Positive Discipline Social Network (and used by permission) provided an excellent opportunity for me to teach about the Take Time for Training tool card. An excerpt from the book Positive Discipline. Listen to this success story podcast of a single dad who scheduled special time with his teenager. Teachers may be surprised at how effective it can be to spend two or three minutes after school with a child and NOT talk about the child’s problems. Instead they can ask questions such as, "What is your favorite thing to do for fun?" Then share what you like to do for fun. Students feel very special when a teacher also shares things that reveal who they are as a person. Many teachers have reported that simply spending a few minutes after school with a child for special time has helped the child feel encouraged enough to stop misbehaving, even though the misbehavior is not mentioned during this time. Mrs. Petersen was concerned about a child in her room whose mistaken goal was power. Debbie often refused to do her work and openly displayed hostility with sneers and sullen looks. Mrs. Petersen asked Debbie to stay after school one day. Debbie stayed, looking as if she were ready for a battle. Mrs. Petersen did not mention any problem behavior; she instead asked Debbie if she would tell her about the most fun thing she had done the night before. Debbie would not answer. Mrs. Petersen thought, "This isn’t working," but continued "Well, I would like to tell you what I did for fun last night." She then went on to share something she had done with her family the night before. Debbie still refused to respond. Mrs. Petersen told Debbie she could leave, but she would love to hear from her anytime she felt like sharing what she liked to do for fun. Mrs. Petersen felt discouraged, thinking the exchange had not been very helpful. However, the next day she noticed Debbie no longer had a chip on her shoulder and did not display any hostility. After school Debbie showed Mrs. Petersen a picture she had drawn of herself and a friend riding bikes. She explained this was the most fun thing she had done the night before. Mrs. Petersen then shared another fun thing she had done. If you analyze it, you will understand why such a brief exchange can have such dramatic results. First, the child feels singled out for special attention. The child may reject this special attention at first because of his or her suspicion that it will probably be another session for blaming and lecturing. Second, the child experiences the unexpected when the teacher ignores behavior problems. Third, adults often show interest in having children share, but they don’t demonstrate mutual respect by sharing themselves. 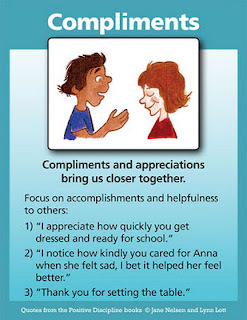 A child may feel extra belonging and significance when you share something about yourself. It is suggested that teachers spend a few minutes of special time with each student in their class during the year. Start with the children who seem the most discouraged, but keep track to make sure you don’t miss anyone. Many teachers complain that they don’t have time for special time. It is true that teacher’s are feeling so much pressure to help students pass academic tests. However, teachers who understand that encouragement is just as important (if not more) as academics find a few minutes while children are doing seat work or walking in line. Recently I was asked why children need routine charts when adults don’t need them. I pointed out that many adults create lists to help them keep track of what they want to do during the day, week, or month—and feel such a sense of accomplishment when they get to cross things off their lists. Many create goals and write them down to increase the effectiveness of their resolve. Others carry day planners to keep track of their appointments (and lists and goals). 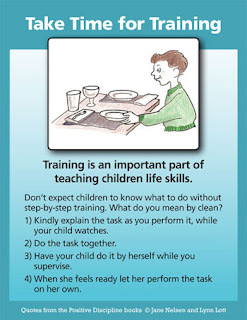 Creating routine charts is great training for children to learn time and life management skills. 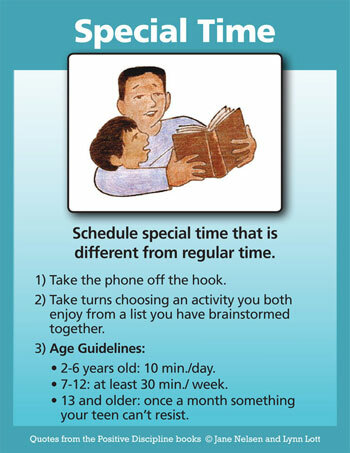 Parents help their children by guiding them in the creation of their routine charts instead of creating charts for them. 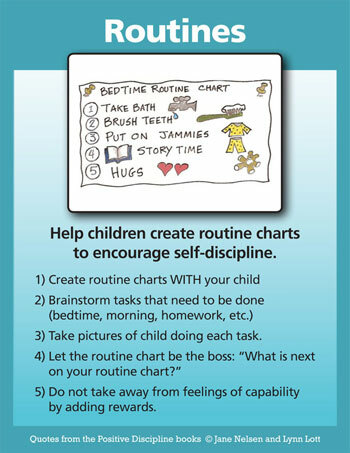 Parents add to the effectiveness of routine charts when they allow their children to experience the satisfaction of following their charts because it feels good (a sense of accomplishment) instead of giving them stickers and rewards—which takes away from their inner sense of accomplishment. 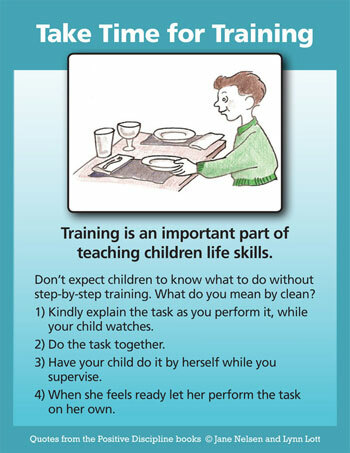 Some parents forget that their most important task is to make their job obsolete. Their job is to help their children be self-sufficient instead of dependent. Teaching children to create routine charts is a great step toward that end. Does this mean that routine charts are magical and will prevent all future resistance and challenges from children? No. Testing their power is part of their individuation process. However, working “with” children to help them learn skills will make your job obsolete much quicker and more effective than thinking it is your job to be in charge of everything they do. Guiding your children to create routine charts is just one of the many ways you can empower your children to feel and be competent and capable. The more children do for themselves, the more capable and encouraged they feel. 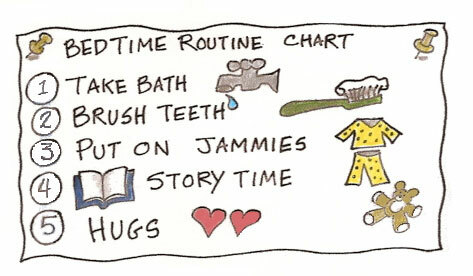 One of the best ways to avoid bedtime hassles and morning hassles is to get children involved in creating routine charts and then letting them follow their charts instead of telling them what to do. Start by having your child make a list of all the things she needs to do before going to bed. The list might include, pick up toys, snack, bath, pajamas, brush teeth, choose clothes for the next morning, bedtime story, hugs. Copy (or when children are old enough let them copy) all the items on a chart. Children love it when you take pictures of them doing each task so they can paste the picture after each item. Then hang the chart where she can see it. Let the routine chart be the boss. Instead of telling your child what to do, ask her, "What is next on your routine chart?" Often, you don’t have to ask. She will tell you. Choosing clothes the night before is one task that eliminates some morning hassles when children follow their morning routine (for which you may have another chart). If they have laid out what they want to wear the night before, they don’t get upset trying to find something the last minute. Other bedtime routine tasks that make mornings routines go more smoothly is for children to make their school lunch the night before. Remember that the goal is to help children feel capable and encouraged. A nice fringe benefit is that you will be able to stop nagging and will experience more peaceful bedtimes and mornings. Click Here to read a Routine Chart success story.